An outstanding daylily in so many ways! Its apricot-hued flowers appear to sparkle in the afternoon sun—and it's the perfect size for containers and edging walkways and borders. A dwarf daylily, Apricot Sparkles grows 15 in. tall with a similar spread. 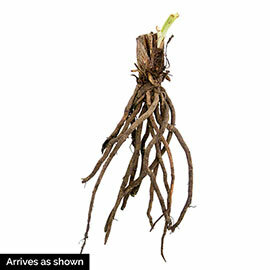 Its petite, 3-4 in., ruffled flowers bloom in early summer and then rebloom from late summer to early fall. 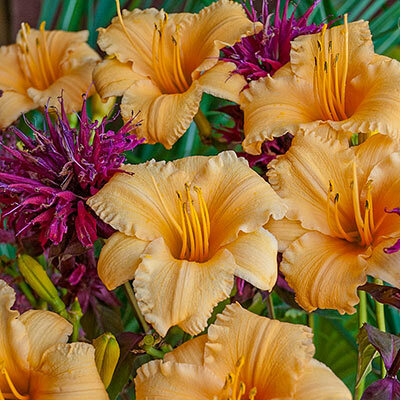 Like other daylilies, Apricot Sparkles is low maintenance and adaptable. It's an excellent choice for perennial flower beds, rock gardens, planting in large masses or growing as a ground cover on slopes. Plant in full sun to partial shade. Bareroot. Zones 3-9. Depth: Dig a hole large enough to spread the roots without bending them. The area where the top of the plant meets the roots should be at ground level. Color: Flowers have shades of apricot and peach. Blooms: Early summer, and again in late summer to early fall. Flower Form: Single, 3-inch, trumpet shaped apricot flowers. Soil Requirements: Well-drained, average soil. Pruning: After flowering, remove spent blooms to maintain attractive appearance.